How is it going with the conversion of your motorbike? I want to convert my 1982 goldwing gl1200 in a electric motor bike. I am thinking about a rear wheel engine, so i have a lot of space for the battery's. Qs motor 3000Watt seem to be a good choice. i don't know what maximum speed will be. Is there somebody who can give me an calculation for that? First off, if it's a 1982, then it's a GL1100, not a GL1200! 3,000 watts for a motor is not going to get you going very fast. 3,000 watts equates to 4.02 horsepower. To get near the 81 hp of the GL1100's engine, you'll need a 60,000 watt motor. You are write its a 1984 i check the papers. It is a 1200 espencade. For about 2500 euro i can get battery total of 11kw/h from chine. Its a lot of money buts its the best deal so far. engine 1000 euro. controller en some electronic stuff 500 euro. 4000 euro. Quite a lot of money to drive green. Well lets say its for our children's future. I would think that starting with a much lighter motorcycle (than the goldwing) would be a better starting point for this project. 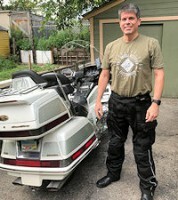 The goldwing is a very heavy bike and not a good choice for an electric conversion, the frame and everything was built to handle 100 horsepower, if you are only going to put a 10 or 20 horsepower motor in the bike, I would be looking for a much smaller and lighter frame to use. You are going to loose a lot of performance and economy because of all the excess weight that you are trying to move..